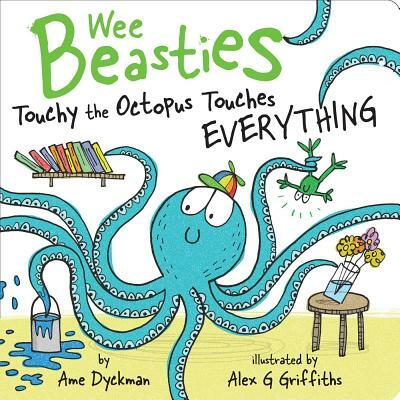 Help little ones learn to look but not touch in this third story in the adorable Wee Beasties series from New York Times bestselling author Ame Dyckman. Touchy the Octopus LOVES to touch the things he loves. But sometimes, he touches everything. WAIT! Can you show Touchy how to look but not touch? Wee Beasties is a board book series from New York Times bestselling author, Ame Dyckman, featuring silly animals doing the things they love just a little TOO much. Ame Dyckman is the award-winning author of Wolfie the Bunny, Horrible Bear!, Boy + Bot, Tea Party Rules, and the Wee Beasties series. Ame lives in New Jersey with her family, pets, and hair bow collection. Alex G. Griffiths is a children’s illustrator specializing in pen and ink drawing with a traditional feel, hand-made illustrations, children’s storybooks, character design, illustrated branding and packaging, editorial illustration, prints, t-shirts, and much more.